Ã¢â‚¬Â¢ Fully stainless steel construction features maximum durability and convenient cleaning. Ã¢â‚¬Â¢ The front and rear end can be equipped with an automatic conveyor to make an automatic production line. 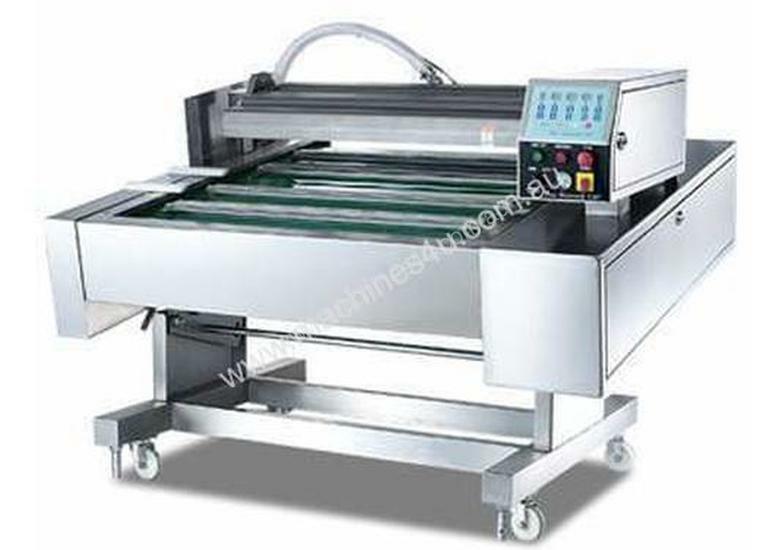 Ã¢â‚¬Â¢ Equipped with a conveyor belt, the machine can perform continuous operation. This greatly upgrades production output and saves manpower and time. Ã¢â‚¬Â¢ In case of packing plenty of liquid products, To adjust the angle of the conveyor table to prevent the product overflowing. 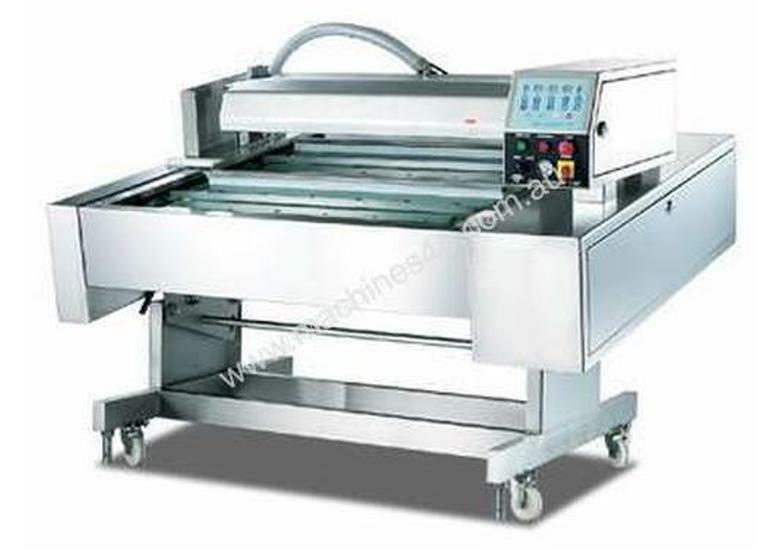 Ã¢â‚¬Â¢ The conveyor belt features automatic washing which is conveniently done by simply connecting it to a water hose. Ã¢â‚¬Â¢ Stainless steel chain meets food sanitation requirements and ensures product quality. Ã¢â‚¬Â¢ Highly efficient European vacuum pump. Microcomputer control system is waterproof. Ã¢â‚¬Â¢ 10 programmable memories setting system, individual display provides easy reading and operating. Ã¢â‚¬Â¢ Applicable for various mass production factories. Ã¢â‚¬Â¢ Maintain food's freshness and original flavor. Anti-spoiling. Ã¢â‚¬Â¢ Prevent electronic and hardware parts from oxidization. Ã¢â‚¬Â¢ Available for solid, Powdery and liquid products. Ã¢â‚¬Â¢ Fresh meat, seafood, pickled vegetables, agricultural products, tea leaves, herbs, powder, spices, bean paste and prepared foods...etc. Ã¢â‚¬Â¢ Electronic parts, hardware products, medical instruments, medicine, clothing or blankets...etc. * Other options may be available - please consult your requirements with our sales staff. * The above specifications and actual appearance may change without prior notice. * Price may change subject to currency fluctuation without prior notice. * Pricing of options is valid only if ordered together with the machine (additional freight cost will incur if ordered separately).